I live in the muddy water and on the grassy bank. I look like the muddy water and the grassy bank. That is why I am hard to see. ‘Can You Find Me?’ features a collection of Australian animals (large and small) living, hiding, in their particular environment. Each double page spread draws their home, and suggests why they might be hard to find. The final line on each spread then asks ‘Can you find me?’ Endpapers show ‘specimens’ from a range of Australian native plants set in white paper. Illustrations are watercolour and realistic in style. Camouflage is a great tool for survival, particularly if an animal is not the fastest, biggest or top of their food chain. Each of these Australian animals from the echidna on the cover to the leaf moth and stick insect has adapted to be able to hide in plain sight. The invitation is explicit in the title and young readers will enjoy finding each animal. Text spells out why they are hard to see: ‘I live in the … I look like the …’ and then asks the reader to search the image. An introduction to camouflage and Australian creatures large and small. Recommended for pre-schoolers. with her brother and her niece. because it’s so like Greece. Since the first white settlers arrived in Australia, there have been ongoing debates, discussions and worse, regarding just who has the right to be here, or to call themselves Australian. This is a really important topic, but not always an easy one to explore in a child-accessible way. I’m Australian Too manages to explore a wide range of versions of being Australian, from the first peoples, through to refugees – including those still waiting to find out if they will be ‘let in’ – in a form which is easily digestible but also offers a way to discuss belonging and nationhood with even quite young children. Opening with the lines I’m Australian!/ How about you?, each subsequent spread is from the voice of a different Australian child, telling where their family is from and where they live now. The closing pages focus on Australia’s tradition of opening doors to strangers, with echoes of the national anthem, and a reminder (or rejoinder) to live in peace. The important message of the story is reflected in the wonderful illustrations, showing the diversity of Australian homes, customs, landscapes and, of course, children. Perfect for classroom discussions of belonging, multiculturalism, refugees and more, this is also perfect for at home sharing. Penguins and possums and pelicans too. Surf-riding seals on a hot summer’s day. Card-playing crocodiles, shells on the sand. At this wonderful, colourful ALPHABET BOOK! ‘Koalas, Kites and Kangaroos: An Australian Alphabet Book’ is exactly what it says: an alphabet book. As well as Australian animals, there are words describing the Australian life including kiting, surfing, ‘beaching’. There are also a broad range of other words that young readers will be familiar with including shapes, foods and plants. Words are listed down each side of openings, with two letters sharing an illustration. Illustrations are in watercolour set in frames on each opening, although the ‘characters’ often burst beyond their frame. A list in the final pages, offers the opportunity to return to images to find other, perhaps less obvious words. 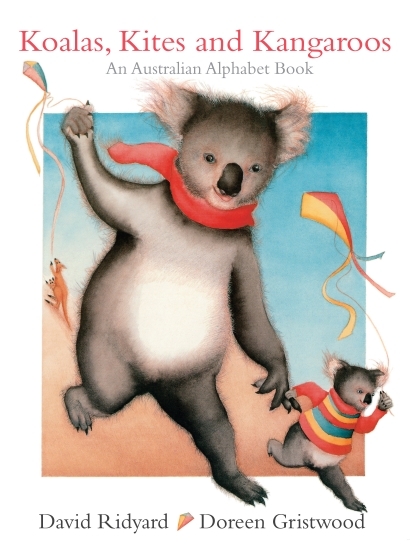 Koalas, Kites and Kangaroos was originally published in 1985 and reprinted several times before this new edition from Scholastic in 2013. It’s pitched at young children beginning to access written language. The animals are anthropomorphised to extend the alphabet into scenes familiar to many young Australians. Echidnas feature on the ‘A’ page, and the list at the end identifies them as ‘anteaters’, providing the opportunity to talk about animals being named by their activity as well as having a scientific name. A zebra does appear on the ‘z’ page, but it is in a zoo, opening the discussion about native and other animals. Recommended for pre-schoolers. and a kookaburra in a gum tree. Christmas has arrived Down-under, and everything has an Aussie flavour. Instead of gold rings and lords, there are five kangaroos and it’s lizards who are doing the leaping. And mighty hot work it is too. Can you trust the crocodiles who look like they are sleeping? Each opening has a new day of Christmas and then vignettes of the previous days. Final pages postcard Santa’s movements across the festive season, and include a black line master colouring sheet. Along the bottom of each opening, characters prepare for Christmas Day. Illustrations are alight with Michael Salmon’s distinctive humour and absurdity. Christmas in Australia is a different experience to Christmas in the northern hemisphere, but we are steeped in the traditions, music and icons of a cold celebration. Salmon’s The Down-under 12 Days of Christmas takes a known song and makes it uniquely Australian. The images are full of Australian animals pursuing Australian summer activities (except of course those skiing snakes … ). There is plenty of fun and humour to engage young children. Recommended for junior primary readers.